A public inquiry into a proposed £100m racecourse development in Greater Manchester has commenced. Developers Peel Holdings wants to build a racing track and other services, such as a hotel, as part of its Salford Forest Park scheme near Boothstown. Salford councillors and residents oppose the plans as they say it will increase noise and traffic. The developers said, apart from 30 race days a year, the traffic situation would actually improve in the area. Phillip Rothwell, Peel's senior development planner, said the plans cater for the worst case scenario - a 20,000 spectator event held once a year. "They'd be a maximum of 30 race days in the year so the remaining 330 odd-days you'll actually get an improved situation," said Mr Rothwell. "That's what our traffic people tell us, that's what the Highways Agency tells us and that's what Salford engineers tell us." But Worsley councillor Karen Garrido, who is a member of racecourse opposition group Residents Against Greenbelt Erosion (RAGE), said Peel's noise and traffic surveys were inadequate. "They were carried out in the school holidays and at weekends, relatively quiet times that gave a false impression of the level of vehicles already on the road," said Ms Garrido. 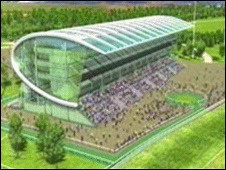 The plans for the development would see a floodlit oval racetrack with a 6,000 capacity grandstand built on greenbelt land. The scheme would also include a four-star hotel, an 18-hole golf course and a nature reserve.